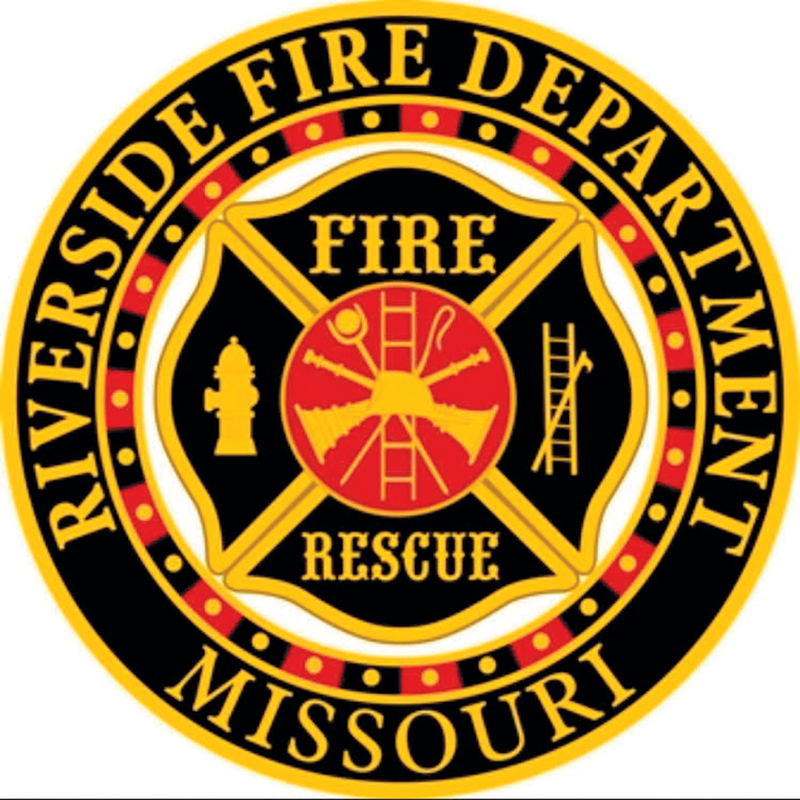 Pine Point Fire Training and Consulting, a Maine Based Fire Officer Training Company, traveled to Holden Missouri on March 17, to present an all-day seminar on Short Handed Firefighting for the Johnson County Missouri Fire Association. Over forty firefighters attended the program. Fire Chief Bill Haggard retired after 35 years as Fire Chief of the Herculaneum Fire Department. Bill started as a Junior Firefighter in 1968. 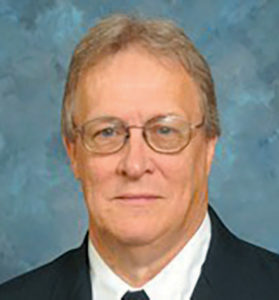 He joined the department as a volunteer in 1969 at the age of 18. Through the years he moved through the ranks as lieutenant, captain, assistant chief and on January 1, 1982 he assumed the position of fire chief. He is currently the president of the Jefferson County Firefighters Association and has chaired the annual Jeffco Fire Engine Rally for 25 years. He officially retired as fire chief on December 31, 2017. Bill will remain as a member of the fire department in a limited capacity. Assistant Chief Chris Baker has been selected to serve as the interim Fire Chief until the department election occurs in June 2018. Chris started as junior firefighter and joined the department in 1996. He has served in the position of captain and has been the assistant chief since 2008. The Herculaneum Fire Department thanks Chief Bill Haggard for his forty-nine years of service and dedication. Mike Shelton is retiring from the City of Riverside on July 2, after close to 40 years of service and almost 50 years in public safety. On Friday, June 29, at 6:00 p.m. we are having a little get together to honor Mike and his service. The Argosy Casino is hosting it for us in one of their ballrooms, there will be some light snacks and a cash bar for beverages. We have some presentations for him to put in his man cave at home. If there is anyone who wants to present something or speak please let me know at my below contact information. Or if you have memories you would like for us to put up on a slide show or a poster board etc. If you know someone that knows Mike please pass this along to them. The Cedar Hill Fire Protection District has purchased a new 2018 Pierce Tanker. The tanker is built on a Freightliner M-112 Chassis powered by a Detroit DD13 450 horse power motor with a Allison automatic transmission. Truck has a 3000 gallon booster tank, 1000 GMP Pump, 3000 gallon porta-tank, 24’ extension ladder, 14’ roof ladder and 10’ folding ladder, 10” rear electric operated swivel newton dump valve, 2 preconnects and 1000’ of 3” supply hose. This truck replaced a 3000 gallon 1991 Ford L9000 tanker built by S & S. The truck was delivered on March 9th and was placed in service on April 10, 2018 and is housed at the Districts Station 2 located at 8800 State Route 30, Dittmer, MO 63023. T he St. James Fire Protection District placed into service a new tanker. The tanker is a Pierce built on a Kenworth T-800 Chassis. The tanker is equipped with a 3000 gallon tank and a 750 GPM Waterous pump. The apparatus was sold by John Borgmann of Schuhmacher Fire Equipment. The apparatus was purchased with funds from a 2015 AFG Grant. 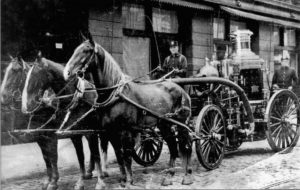 The 1904 Metropolitan, 1,000 gpm steamer saw much duty for Engine Co. 40. The horses are Blondie, Bismarck, and Jim. 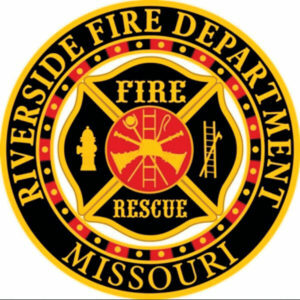 The St. Louis Fire Department was established in 1857 and is the second oldest career fire department in the United States. 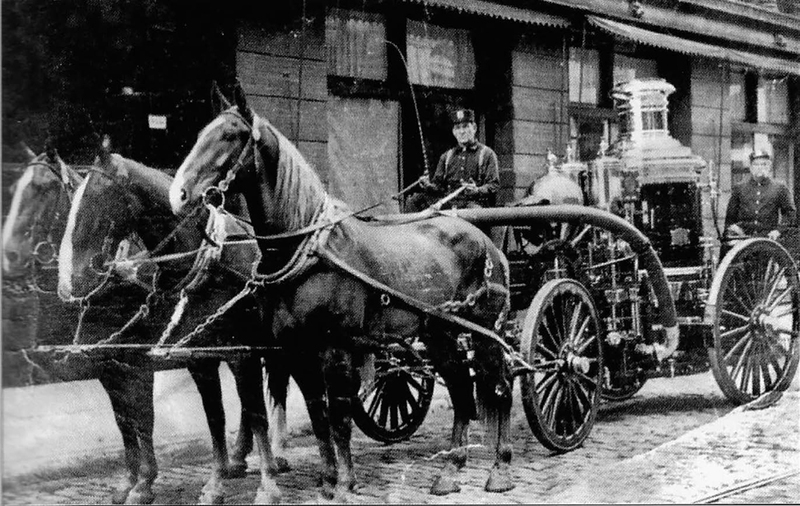 Prior to 1847 a number of volunteer fire companies were in service in the city, starting around 1822. Members of these fire companies came from all walks of life and the fire company member’s wielded considerable political influence. It was the pride and ambition of each fire company to be the first to reach the fire and the most efficient to extinguish the fire. Some thoughts on raising funds for the fire fighters’ museum. 1. Applications to companies and others seeking grants, this is a very difficult proposition. The applications have to be very precise and applicable to the company interests. One of the first questions they want answered is, “How much have you and your constituency invested in this project?” While we have a substantial amount that has been raised and donated, there is still a large sum to complete the task at hand.